USB cable. This is extremely common. Many electronic keyboards and stand-alone MIDI interfaces use this type of connection. To use this type of connection, simply plug one end of the USB cable into the USB jack on your MDI keyboard or stand-alone MIDI interface, and plug the other end into your computer. If you are using a stand-alone USB MIDI interface, you then need to connect standard MIDI cables between your MIDI keyboard and your stand-alone MIDI interface (see the following procedure). If you haven’t already installed the software MIDI driver that came with your keyboard or interface, make sure you do so. Standard MIDI cable. This is also very common. MIDI keyboards usually have jacks for these cables even if they have a USB connection. You need two of these cables. To use this type of cable, use one cable to connect the MIDI OUT jack on your MIDI instrument to the MIDI IN jack on your stand-alone MIDI interface or sound card, and one to connect the MIDI IN jack on your MIDI instrument to the MIDI OUT jack on your stand-alone MIDI interface or sound card. Many stand-alone MIDI interfaces and audio interfaces use this type of connector. Note: If you are only using an external MIDI controller to trigger software instruments, you only need to connect a single MIDI cable from the MIDI controller’s MIDI OUT jack to the MIDI IN jack on your MIDI interface. Figure 34. 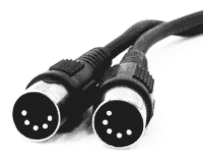 Standard MIDI cable—use this if your MIDI interface has standard 5-pin input and output ports. Joystick connector. This is becoming less common. This is the type of connection seen on older SoundBlaster type sound cards. To use this type of connection, find the end of one of the MIDI cables that is labeled OUT. Plug this connector into the MIDI IN jack on your electronic keyboard. The other 5-pin connector on the MIDI cable is labeled IN. Plug this connector into the MIDI OUT jack on your electronic keyboard. 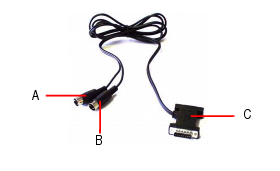 Plug the 15-pin connector on the MIDI cable into the MIDI/joystick port on your sound card. If you have a joystick, unplug it, plug in the MIDI cable, and plug the joystick into the pass-through connector on the MIDI cable. Figure 35. Joystick connector—use this if your MIDI interface is the joystick port on your sound card.